DWK Life Sciences draws on more than 130 years of expertise in designing and manufacturing packaging components for diagnostic tests. 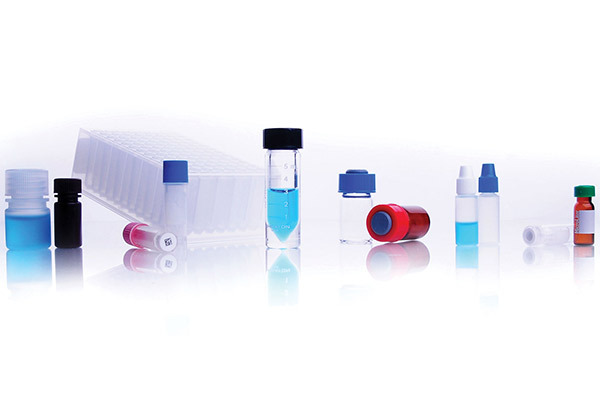 In this image, various DWK products for in vitro diagnostic test kits are shown: leak-resistant plastic bottles, a polypropylene well plate, cryogenic storage vials, and high-recovery vials. DWK Life Sciences is built on the heritage and promise of three companies with long, innovative histories in the labware space, according to DWK officials. Whether the combined strengths of the Duran Group, Wheaton, and Kimble Chase—as DWK—will be greater than their individual merits remains to be seen. The heritage of each of those companies stretches back more than a century and is well-known throughout the world. “While DWK Life Sciences is the company name, we’re going to market as Duran Wheaton Kimble on the strength of our origin brands,” says David Koi, president and CEO of DWK Life Sciences, the North American division of the Germany-based firm. That choice of branding, he says, reinforces the belief within DWK that each of the three companies in the merger is equally important. It also enables the new company to build upon the existing name recognition. Given the history of the three companies and their complementary product lines, a merger was logical. DWK Life Sciences now offers customers a complete, comprehensive line of purpose-built glassware, plastics, and fused-material-based containers for research, diagnostics, and specialty pharmaceuticals markets through DWK representatives, continues Koi. For researchers, the merger may save time. In the near future, they will be able to meet with one sales representative and work with one catalog to view all three product lines. Shipping should be faster, too, because the product lines of each of the three are beginning to be stocked in both the U.S. and Europe. The combined company reiterates the belief, long-held by each of its three components, that labware is not a commodity. Innovations have included: labware traceability, vials that fuse plastic to glass to create shatterproof tools that don’t leach, microplates that thwart nonspecific protein binding, and other solutions to current lab challenges. “Our product focus is predominately glassware. We’re trying to create a larger portfolio of products and services around that, while also manufacturing disposable products and customized solutions,” Koi says. About the time of the merger, innovators within the new company gathered in Germany at DWK’s headquarters to forge the way forward. The goal: to address customer challenges with innovative products, using the insights of each of the three companies. “We innovate by leveraging our combined strengths in R&D and manufacturing, investing in innovative technologies, and listening to our customers,” Koi says. The beauty of the product, he says, is that “this is a solution customers could use off the shelf. They don’t have to figure it out themselves.” The kit is designed to slash configuration time, reduce contamination risks, and improve design flexibility. Currently, that means DWK is optimizing its global product availability. This entails integrating product lines so the full catalog of products is available through each of the three companies and that products are prepositioned in the U.S. and the Europe, and also are readily available through their distributors in the Asian Pacific and Latin American markets. Koi did not go into detail about the other aspects of corporate integration, but anyone who has gone through a merger has a good idea of what’s involved. Linking internal systems for data sharing and ordering, retraining the sales force, realigning staff, and crafting an inclusive corporate culture are just a few of the typical, behind-the-scenes, post-merger activities for any company. Hinting at this, Koi says his mission is to blend corporate cultures and articulate to the workforce exactly what the newly stated corporate values of “passion, precision, creativity, and trust,” mean in their day-to-day work, at every level throughout the company. Duran was founded in 1893 as Glastechnische Laboratorium Schott & Genossen Jena (now Schott) when founder Otto Schott revolutionized labware with the development of glass made from borosilicate rather than the soda-lime or lead glassware common at that time. The new glass made it possible for scientists to measure temperatures up to 500 degrees Celsius. Otto Schott recruited physicist Ernst Abbe and optics pioneer Carl Zeiss as cofounders. In 1938 in Berlin, the glass was registered as the Duran® brand to differentiate between laboratory and consumer applications of the glass. Eventually, the Duran brand would boast some 5,000 standard lab products. Wheaton was founded in 1888 by Theodore Corson Wheaton, M.D., as T.C. Wheaton in Millville, NJ. The company became known as a glass innovator. It overcame the challenges of Great Depression by automating, which allowed it to grow. It remained a family company until 1996, when it was acquired by Algroup, which was acquired by Alcan of Canada in 2000. The assets of a spinoff company (which filed for bankruptcy in 2005) were acquired by Gujarat Glass in India and Kimble Glass, by then a subsidiary of the Gerresheimer Group in Germany. At that point, in 2006, the group spun-off Wheaton Science Products, which was renamed Wheaton Industries. The spin-off heralded innovation in labware for research, diagnostic packaging, and specialty pharmaceuticals industries. Kimble Chase also has a century of innovation behind it. Founded as Kimble Glass® in Chicago, it became a source of volumetric glassware for scientific labs. The company operated independently until 1997, when it was acquired by the Gerresheimer Group. Kimble Chase Life Science and Research LLC was formed in 2007 in a joint venture between its parent company and ThermoFisher. David Koi, president and CEO of DWK Life Sciences, is the former senior vice president of global portfolio management at Fisher Scientific. Focus: DWK Life Sciences develops premium labware, including disposable products and customized solutions for scientific applications.